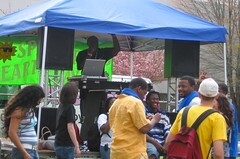 Spring Fling on campus today. This is always a fun day with clubs selling food, raising awareness on issues, climbing inflatable obstacles courses and more. Glad the rain held off to make it a little easier for the Student Life staff.